O’pen BIC will be the Half Time Show between Race #1 and #2 of the America’s Cup Finals June 17, as well as other O’pen BIC “Un-Regatta” events being held June 15, 16, and 18th. Thirty-two very fortunate sailors, age 15 and younger, are being selected from eleven nations to participate in this premier event – Qualification System. Check out the Notice of Race and for further details the NoR Supplementary Information. 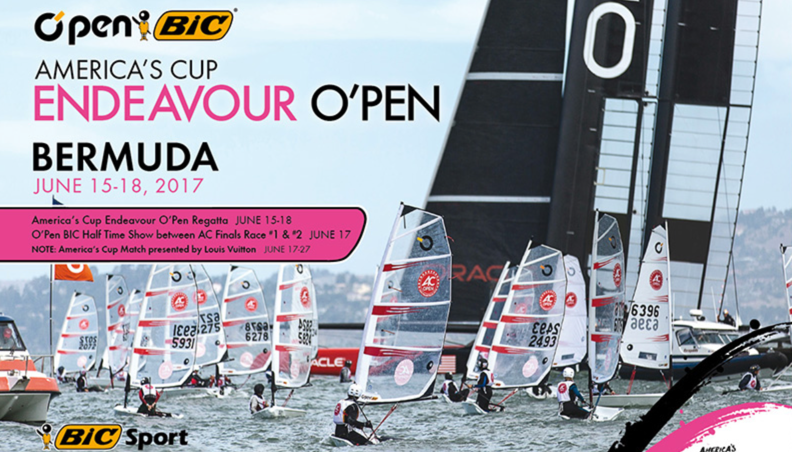 Rustic accommodations, Entry, and O’pen BIC charters are being provided courtesy of O’pen BIC and the America’s Cup Event Authority. - In 2017 we will be centre stage!